I'm continuing with my quest to actually use my washi tape collection! And I've made an important discovery - washi tape makes makes very quick but effective cards! I can't believe it's taken me so long to stumble over this revelation! Washi Tape and Stampin' Blends alcohol markers - a perfect union! 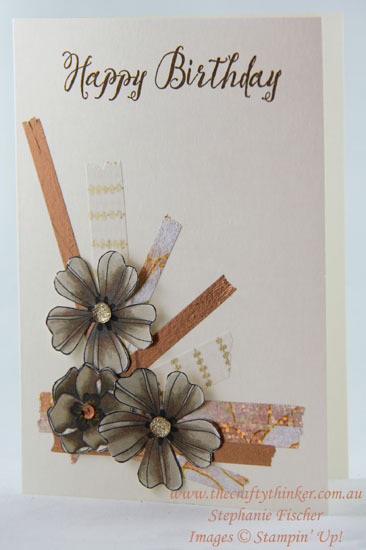 Having applied the washi tape to the Very Vanilla card, I stamped the greeting from Feather Together in Soft Suede ink and adhered some flowers! I did take an extra minute to add some Gold Faceted Gems and a Metallic Sequin to the flower centres but that's it! Done! The flowers (from Color Me Happy and Flower Shop) were stamped with Tuxedo Black Memento ink and coloured with the new Stampin' Blends alcohol markers that are available from today. I fussy cut them all although the Pansy Punch does coordinate with the Flower Shop images.